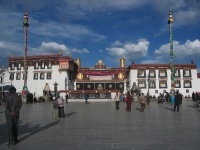 The Jokhang Temple lies in the heart of old Lhasa. It was built nearly 1,300 years ago but remains the spiritual centre of Tibet, drawing pilgrims from all over the region who come to demonstrate piety to the Buddha. The original structure was enlarged under the reign of the Fifth Dalai Lama and it now stands as the product of Han, Tibetan and Nepalese architectural design. It is a four-storey timber temple with a golden roof and it contains numerous valuable cultural relics and sacred sculptures, and features some magnificent murals in the main hall. Possibly the most special statue is the site's original sculpture of Buddha, called Jobo, which is richly decorated with jewels and silk. An annual prayer festival is held in the temple, which is also the venue for the initiation of the Dalai Lamas. The Jokhang Temple is a UNESCO World Heritage Site and it is generally considered to be Tibet's most sacred and important temple. It is certainly one of the most popular tourist attractions in Lhasa. By all accounts, Jokhang Temple is a profoundly special place and it is said that travellers who stay long enough will discover that they are a Buddhist.